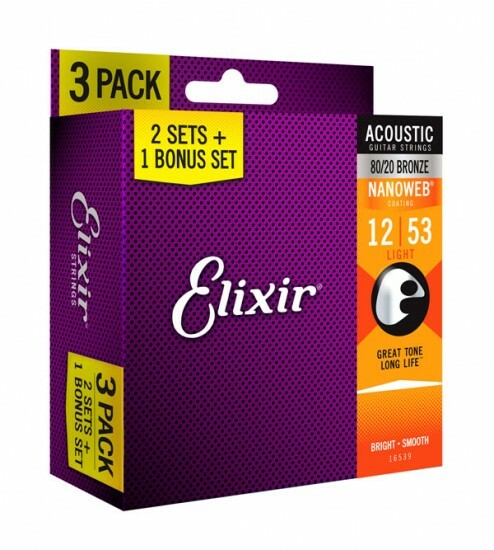 Elixir 16539 Nanoweb Coated 80/20 Bronze Acoustic Lt 12-53 3-PACK - BUY 2 SETS GET 1 FREE! For me these strings last at least a month longer than all the other strings I've tried and sound just as good, if different as you might expect. Sometimes I use other strings for recording because they sit better in the mix, having a more narrow and focused sound, but for just sitting around and playing and listening to an acoustic guitar nothing I've tried beats these.